Stuart is an HR Partner within Crispin Rhodes and provides HR advice & support to businesses across St. Albans & Hertfordshire. 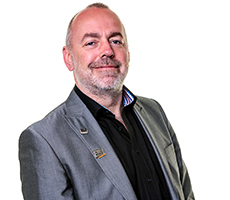 Stuart is a member of the Chartered Institute of Personnel and Development and has a background of working in the public, private and not-for-profit sectors. Stuart specialises in employee relations and understands the relationship between employer and employee, providing solutions to disputes in the workplace and providing management coaching to avoid re-occurring issues. A BIT ABOUT STUART Stuart is passionate about helping people and undertakes voluntary work for the St Albans Good Neighbourhood Scheme. In his spare time he plays tennis for St Albans Tennis Club and captains the men’s first team in the Hertfordshire League.